Names and Septs: MacCamish, MacCash, MacCosh, MacLaws, MacLehose, MacTause, Stephenson, Steven(s), Stevenson, Stevenston, Stivan, Taweson, Tawesson, Thom, Thomson, Thompson, Thomas, Thomasin, Thomason, Thomassine. Thomazin, Thomerson, Thomes, Thompson, Thomson, Todd. 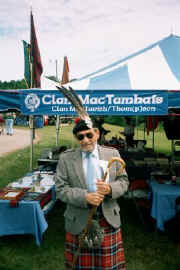 Dugald MacTavish of Dunardry, Chief of Clan MacTavish. Photo taken June 2001. Died June 19, 2005.